Recent weeks, I’ve been trying to make a GURU synth-definition file for a cheep japanese gadget called “Pocket Miku”. It includes the YAMAHA’s NSX-1 chip, which has an eVocaloid and GM instruments (with XG effects). During making it, I feel its a pity that Renoise cannot control GURU by the automation. 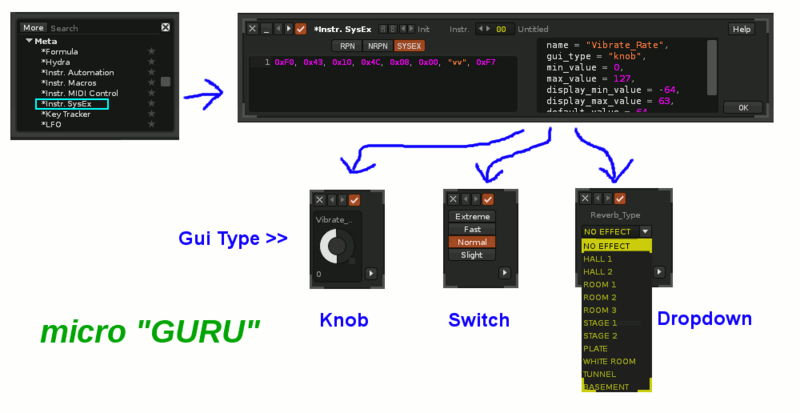 In NSX-1, the lyrics of Miku are treated as SysEx, but Renoise cannot send SysEx in it’s sequencer, so I have to send SysEx manually from GURU-panel. Well, Miku is a bit funny example though :rolleyes: , I think it’s better if Renoise can send SysEx (and RPN, NRPN) and control them by the automation natively. Simply, it’s the best if Renoise can control all GURU parameters by the automation, but it’s hard to implement technically, isn’t it? So I imagine something like “micro GURU device”, which can send only 1 SysEx message like the image below. Ofcourse it’s good if it has 8 parameters like the Doofers, but maybe it will be too complicated (? ), so I suggest 1 parameter only anyway. I think it’s better if Renoise can send SysEx (and RPN, NRPN) and control them by the automation natively. I like the sysex thing. Sysexxy. But RPN and NRPN doesn’t really belong here, IMO - it’s like mixing apples and oranges. Makes a nice fruit salad though. I’ve been looking for an easy way to send sysex in the sequencer for ages now. I would gladly be willing to pay something for a plugin such as this. Yes! Anyone who uses external sound devices could really use this. Ableton doesnt even supprt sysex, this could be a selling point for renoise! Especailly as we already have a load of people with solid guru patches, we could bundle 20-30 synth patch editors in with the daw.